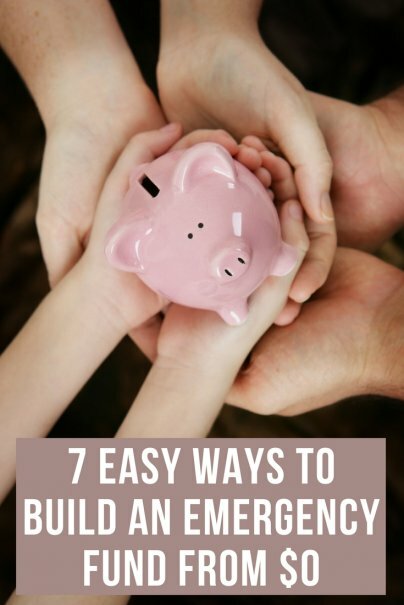 Needing an emergency fund when you're living paycheck-to-paycheck feels like a classic Catch-22: You need a savings cushion to protect yourself in case of an emergency, but you don't make enough money to create that cushion before the next emergency strikes. It's enough to make you want to throw your hands in the air and give up. In 2017, the average American received a tax refund of $3,050. That's over $250 per month that's taking a trip to the IRS and back. Just imagine how quickly you could build up your emergency fund if that extra money was still in your paycheck each month. Doing so is as easy as adjusting your withholding allowances on your W-4 form with your employer. To do this, first use the IRS withholding calculator to determine how many withholding allowances you may take. Remember that the withholding allowances you claim do not determine your tax bill, only how much you pay in taxes per paycheck, so your answers on the calculator can be approximate. Once you have figured out your allowances, request and fill out a W-4 form from your employer's human resources department. It can take about a month for the new paperwork to make a difference in your paychecks, although it could happen as quickly as your next pay cycle, depending on your HR department. While you're at it, set up an automatic transfer of the extra money into your emergency fund so that you are not tempted to spend it. When an emergency strikes, it can become clear that some of the stuff you own may be less important than you think. Instead of waiting for an emergency to realize that you don't truly need two gaming systems or 18 pairs of shoes, start looking at your stuff as if the emergency has already occurred. That will help you better understand which items are truly important to your well-being, and which you could stand to live without. The good news is that if you are selling stuff to fill your emergency fund, you have time to get the best prices for your items. From online marketplaces like eBay, Craigslist, and Facebook, to local consignment shops and yard sales, there are a myriad ways to reduce your clutter while increasing your bank account. Set yourself a goal of selling at least one item per week and depositing the money into your emergency fund. The additional money will help your emergency fund grow quickly. There are a few service providers that are open to negotiating with their customers. These companies are generally eager to give price breaks to their customers in order to keep them. The best way to get a better price from your cable/internet provider is to research the lowest going rates in your area — either the price your provider is offering to new subscribers or the rates offered by the competition — and use that price as leverage in your negotiation. When you call, ask to speak to the retention/cancellation department, since that staff generally has the most authority to make deals in order to keep you. Cellphone companies can also offer some wiggle room in their pricing, although timing is important. You are more likely to successfully reduce your cellphone bill if you negotiate toward the end of your contract when your provider is desperate to hold onto you. Remind your provider of your loyalty, since it costs cellphone providers much more money to gain new customers than it does to retain existing ones, and be willing to actually cancel and defect to a different provider, since having some teeth behind your threat to cancel will give you the upper hand in negotiation. Though it may seem set in stone, your rent payment may also be negotiable, especially if you are a reliable tenant and you have plans to stay put for some time. You can request a longer-term lease in exchange for a lower monthly rental payment, which can be a win-win for you and your landlord. When you need to fill up your emergency fund in a hurry, a spending ban can help you find the money you need. A spending ban is a period anywhere from one week to one year wherein you refrain from all spending, other than for necessities. Going on a monthlong spending ban can help you to free up money in your budget to pad your emergency fund without otherwise affecting your bottom line. Here's how it would work: Decide at the beginning of the month what your absolute necessities are. These will include your rent/mortgage, utilities, credit card bill, car payment and gas, child care, food, and health care. For the month you are taking part in the spending ban, you will live without anything above and beyond those necessities. The one caveat to a spending ban is recognizing that it can be easy to jump right back into your old spending habits as soon as it is over (or alternately, have a "last hurrah" spending binge before it starts). Don't let your spending ban give you permission to overspend before or after the month. There is something to the adage "Out of sight, out of mind." You are much less likely to spend money if you don't know it's there — just as you are less likely to crave ice cream if you don't know there's a pint of Ben & Jerry's in the freezer. That's why you can help pad your emergency fund by hiding money from yourself through creative accounting. To do this, simply subtract $100 from your account register for your checking account. You won't know the $100 is there, so you'll spend as if you were $100 poorer. But the money is still there, and at the end of the month (or several months), you can put all of your phantom savings into your emergency fund. This method may not work for all savers, however. Anyone who does not bother with an account register will not be fooled by this kind of mental trickery. Finding a way to make a little extra money on the side can be one of the fastest ways to build up an emergency fund. While traditional part-time jobs are always an option, modern technology has also made it possible to find a side hustle with flexible hours or one that allows you to work from home. Since your hustle money is over-and-above your normal paycheck, it can help you bring your emergency fund from zero to impressive as quickly as you are willing to hustle.